Included for a limited time: the Wolfpack expansion! NOTE: This version of the game was produced after a successful Kickstarter campaign. Backers received copies of updated editions of the Classic Movie Monsters, Night Terrors, and Urban Legends expansions as stretch goals, as well as 20 bonus cards, a deeper storage box, and access to different art packs by various artists. This non-Kickstarter version is available separately commercially, as well as a non-Deluxe version. This is the 2014 version of the game. Prior versions were published as the Ultimate Edition (2008-2013) and the Whitebox Edition (2007-2008). I think this is a great game as an ice breaker for a meeting, or a night of gaming. I handed out the cards, made sure to tell everyone to keep things a secret and to listen to the me, then I started the game. I had everyone use their own names and make up a story of what they do in the “village”. Some people came up with great stories, some gave their name and nothing else. Those people usually are killed of the first night and they get to sit and watch the game unfold. After the game ends (which took 30 minutes with 20 people), everyone wanted to play it again. The next turn I did the same thing, because I’m horrible with names and I know others are as well, the people that gave just their name, suddenly had an interesting story. We played 3 times in a row. The best part was after we were done, it was a running joke of who the werewolves had killed first and everyone had know each others name the rest of the night and the mix of friends were all talking. 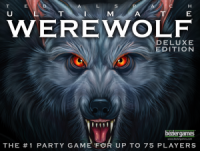 Add a Review for "Ultimate Werewolf Deluxe Edition"